Lubna Albalkhi (right) and her children Mohammed, Bisan and Leen in Berlin around December 2015. The Albalkhi family, including Lubna's husband Sarhan, fled Syria in October. A German woman has helped them with their paperwork and to get jobs and homes in Berlin. She believes if every person helped one family, the refugee crisis would be over. This story is part of a series of stories written by student journalists who participated in UB’s Foreign Reporting study abroad program in Berlin, Germany this past winter. A small raft drifts in the black night of the Mediterranean Sea. Its engine is dead. The raft is designed to carry 19 people but at least 60 seasick and silent people fill the inside, waiting to die. The trip from Turkey to Greece should take 30 minutes, but they have been at sea for more than eight hours. The waves carry vomit, and children doze as the driver desperately tries to get the cheap engine to run. It has been stopping and starting for hours. This time it seems determined to stay dead. Sarhan Albalkhi, a 43-year-old emergency room doctor from Syria, gazes upon his family. His normally talkative daughter Bisan, 4, lays silently and Leen, a 7-month-old, sags sickly in his wife Lubna’s arms. Soft-spoken with large, caring eyes, Lubna is waking up their eight-year-old son, Mohammad, who is exhausted from the grueling voyage. She wants her first-born to be conscious if these are his final moments. Mohammad and Bisan wear life jackets, but Leen is too small for one to fit. Lubna determines to cling to her baby. “I felt like a criminal,” said Albalkhi, who in September had scraped together $5,000 in illegal American money to pay a smuggler to take his family on the raft. He feared cold foreign water would be the last memories his children had. He worried his choice to leave Syria, where civil war has killed more than 250,000 people over the past five years and has caused more than 4.5 million Syrians to flee, was a mistake that had doomed them all. For the past year and a half, millions of immigrants have – like the Albalkhis – traveled on rafts from Syria, Iraq and Afghanistan to Europe in the world’s largest migration since World War II. Of these immigrants, more than 5,000 have drowned, according to the International Organization for Immigration, including 3-year-old Aylan Kurdi, whose tiny body washed up on a Turkish resort beach in September and caused a media sensation and an outpouring of attention. The millions of refugees pouring into Europe have ignited a European and international debate about what to do with so many needy people and if western nations can and should accept so many strangers. The Albalkhis landed in Berlin, Germany in December and their story of luck, friendship, the depth of historical memory and human kindness offers a example of how refugee integration can work. The Albalkhis’ story is also the tale of two German women, a mother who remembers the pain and fear of World War II, and her daughter, who could not see suffering and look away. Both women did something all of us could do, but usually don’t. They stepped beyond the coziness of their daily lives and the confines of their culture to get to know and help strangers. The Albalkhis floated for two hours in the Aegean Sea before their boat’s engine caught and they puttered into Greece. “It was by the power of God alone,” Albalkhi, a practicing Muslim, saud. He smiles and tiny wrinkles line his eyes. From Greece, the family traveled for three weeks in a long blurry trek through Romania, Macedonia, and Hungary, before finally arriving in October in Germany, the landing spot of more than a million refugees from Syria, Iran and Afghanistan in 2015, according to German government statistics. They ended up in a makeshift refugee camp, where they each got a bunk bed in an unheated warehouse housing hundreds of refugees in neat rows. They had nothing, not even privacy or self-confidence. To accept so many refugees so quickly, German Chancellor Angela Merkel made a stunningly simple and singularly moral argument last year: Germany has to open its doors to the needy. And, she said, does Europe. So she did, allowing an unlimited number of refuges into Germany. “If Europe fails on the question of refugees, then it won’t be the Europe we wished for,” Merkel said on August 31, before the Albalkhis even set out. For her singular vision and clarity, Time Magazine named her “Person of the Year” in January. Under Merkel, the nation that blew apart Europe throughout the 20th century has taken in more refugees than any other European nation and 100 times more refugees than the United States. But now, Merkel is fighting the toughest battle of her 11-year reign as the German people and her own ministers have begun to push her to revoke her stance and stop letting refugees enter the country. The borders the Albalkhis crossed so easily last year are now virtually closed. Europe has grown weary and fearful of taking in so many needy people and politicians argue about what such a large, mostly Muslim refugee presence will do to their nations and continent. Merkel’s political party lost support in three regional elections on March 15 and an anti-immigrant party has made surprising gains. The refugee crisis, Bruekner said, could mean Merkel’s downfall and without Merkel, who is the European Union’s staunchest advocate, the EU could collapse. The Albalkhis ended their journey in Merkel’s Berlin, a city still working to shed its identity as the seat of Nazi atrocities and a place where more than 100,000 refugees have arrived since last November. Their presence is visible throughout the city, which has set up refugee centers in most public school gymnasiums and, which has transformed the former Tempelhof airport, built by the Nazis and used by the Allies in the 1948-1949 Berlin Airliift, into the city’s largest refugee camp with 15,000 people. By comparison, Buffalo has taken in about 10,000 refugees in the past 13 years, according to a study by the Partnership for the Public Good. This year, Buffalo is expecting about 2,000 refugees, including some Syrian families, according to Apple Domingo, the New America Director at Jewish Family Services in Buffalo. Berlin is struggling with the burden of so much need. And Germans are asking how to cope with so much difference. One German businesswoman, who goes by the nickname “Um Zino,” has a strong sense of Germany’s unique history and a simple and pragmatic mathematical solution. Germany has 82 million people, she reasons. Since December, Um Zino has helped 16 Syrian refugees – including the Albalkhis – find doctors, get apartments and jobs and begin lives in Berlin. Five years into the Syrian crisis, person by person, she is pulling 16 former strangers into mainstream German life. Um Zino is a woman of purpose and mystery. Tall, blonde and statuesque, she carries herself like the fashion model she hints she once was. Today, she is a business developer, a mother of three grown children and a management coach who lives in a wealthy western Berlin suburb and guards her privacy so tenaciously, she boasts that she cannot be found randomly on the Internet. Hence the nickname, “Um Zino,” which means “mother of your first-born son” in Arabic. It’s the only name she wants to be called by the 16 Syrians and by The Spectrum reporter she met in Berlin in January during a UB Study Abroad course on foreign reporting. In December, she spent 300 hours in German government offices trying to help the Albalkhis and the other refugees get the paperwork they need to begin new lives in Germany. “One by one, against fear, for one second we have to be courageous,” she said. That means approaching people rather than ignoring them or turning them out, she said. It means getting involved and not turning away. It also means being selective and not naïve about which refugees she helps. That’s what she and her mother, Renate Haase, did at Christmastime, when they decided the refugee crisis they watched unfolding on television was something they could no longer ignore. Haase is a child of World War II and vaguely remembers the fear and sense of loss when, in 1945, the advancing Soviet army ordered her German family out of Pomerania, now Poland. She, her mother and 7-year-old sister had to flee. She was not yet two years old, but the story of her mother’s trek to Berlin carrying all they owned on her back is part of family lore. “It was horrible to survive the war and then to be forced to leave your home and everything you loved, to know you would never see it again and to go to the unknown without anything and to have to begin again,” said Um Zino, who heard stories of post-war survival from her grandmother, who died last fall at the age of 102. Her grandmother eventually made it to Berlin. That, and the loss of confidence, the sense you can no longer provide for yourself or your family, that you have to depend on others in a place where everything – the language, the food, the climate, the manners, the expectations – is different. Albalkhi, a proud patriarch, who always had a steady income, averts his gaze when describing his inability to protect his young family in this new land. As Um Zino, her children and mother watched the refugee crisis unfolding in December, they felt compelled to act. “We saw it all happening around us and we decided as a family just before Christmas that we didn’t just want to help, but also get actively involved,” she said. Their story, she said, was similar to her grandmother’s story. Haase, who is retired, volunteered to make the first attempt at contact by going to a refugee center. She brought with her a bag of warm clothes in a size 6 and set out to find someone who could use them. That person was 21-year-old Hanan Thapit, a mother of two children, ages 4 and 8 months, and one of 200 refugees sleeping in rows of bunk beds at an unheated Berlin refugee center. Neither Thapit nor her husband, Osama, 37, spoke German or English, but they smiled broadly and gesticulated their thanks and warmth with their hands and eyes. Their sweetness and gratitude touched Haase. So did the dark circles under their eyes and the glassy-eyed limpness of their feverish young children. She told her daughter, Um Zino, who never does anything halfway, that she had found a family to help. Um Zino met the family for coffee and then quickly got a friend who is a doctor to see the children and prescribe them antibiotics. She then tapped her network of friends and family in Berlin’s wealthy Zehlendorf suburb for help. And, she began to learn the immigration system and made rounds to government offices in order to move the Thapits – and the Albalkhis, who had befriended the Thapits in Berlin – from the large refugee center they were in to a smaller youth hostel around the corner from her house. Um Zino says she had “no idea” what she was doing at the start. That the whole system seemed “chaotic” and that she often doubted what she – one single German – could do. But she kept going. How could she not, she asks. By January, she not only had the Thapits and Albalkhis under her care, but also seven other young men who she met as she became immersed in the refugee world. For each, she helped with paperwork, lodging, medicine and a sense of self-worth. The paperwork for each refugee is extraordinary. Pages upon pages of questions assess everything from schooling and job skills to personal beliefs, health, language aptitude and family history. And everything is written in long, complex German phrases and Arabic interpreters are scarce. Um Zino speaks Spanish and English, so she can communicate with Albalkhi, who speaks English and Thapit, who speaks Spanish. She also now has an Arabic translation app on her phone. Together, sometimes with two or three translating together, she and her band of refugees find ways to understand each other. Each immigrant has to make five or six trips to different offices around the city in order to get signed up for job placement, health certificates, apartment searches, language classes, school places for the children. And – in German fashion – one paper relies on another and another, making the system serpentine and frustrating to navigate. Germany is trying to streamline the process, which was not built to process thousands of people at a time. But for now, it is glacial. Um Zino said she slept three hours a night throughout December and January so she could manage her business and work on the Syrians’ case files. It’s their faces that compel her, she said. And the hope that she would get the same kind of aid if she needed it. Each refugee has a story. Thapit, a cook with startling blue eyes, wants to open a catering business. He lost 40 members of his family in Syria when a hospital near his home was bombed. He broke into tears as he sat at a Berlin table describing the sense of hopelessness of being unable to protect his family along the journey or, on some nights, not even provide a warm place to sleep for his kids. Mann, a 21-year-old barista and artist who used to work at the Four Seasons Hotel In Damascus, dreams of owning his own cafe, but for now just wants a job as a bartender and a safe bed. Ahmed, 24, who wears his long, light brown hair in a bun and speaks almost fluent English, left Syria to avoid being drafted into a war he didn’t believe in. He and his friend Amer, 25, both IT specialists and students, tried to sail to Greece five times. Four times, their raft sunk and they returned to Turkey with nothing except the money they had sewn into their underwear. On one of the failed trips, their raft partially sunk and they spent almost two hours neck deep in water as people tried to throw belongings overboard. The battery acid from the raft’s faulty motor leaked into the water and burned people’s hands and faces, he said. Ahmed wants to go back to school, but first, he needs to finish his German integration and language classes and start earning money. The aid he gets from the German government helps him live, although some days he eats little. But Ahmed – and the others – also need to fit in. None of them know if they will ever be able to return to Syria or if they will ever see the family they left behind. Albalkhi worries what his children will learn in this new homeland and if they will always feel like outsiders. Ahmed is anxious to learn German habits and has already picked up some useful phrases. He worries the hard syllables and foreignness of his name will make Germans fearful. “Will they think I’m a terrorist?” he asked. Um Zino is helping. She’s using her connections to find jobs, apartments and schools. And in the evenings and via daily text messages, she is teaching them what it means to be German. She’s teaching them about shaking hands and about being on time, about looking people in the eyes and about talking to women in the same way as men. She even typed out tips for talking to German women for some of the younger men and one January evening, over a bottle of wine, which only some of the men drank because several are Muslim and don’t drink alcohol, she gave an animated lesson on flirting. She has not, she said, laughed so much in years. They laugh together at the absurdity of German bureaucracy, at the differences in their languages, food and customs. “People can understand each other when they are not afraid of eventual misunderstandings and when they simply have a strong enough desire,” she said. And they celebrate milestones – the children’s birthdays, holidays, bureaucratic triumphs – together, as a new, hodge-podge family built first on need, but now on trust and friendship. But she refuses to do everything. She is making them work, too. She wants them to prove themselves. For instance, she will help one refugee with paperwork, and then expect the one who got help to help the next. She tested Thapit’s skills as a cook by asking him to cater a meal for her and her friends. She let a few of them stay at her house – but only once she knew and trusted them. She made Alaah, a 22-year-old hair stylist, cut her husband’s hair before she tried to get him a job in a salon. She had Ahmed work on her computer. She also lets them repay her kindness in small ways – by washing her car or doing an errand for her. She has asked each of the men in her group to volunteer as a “big brother” for one of the tens of thousands of Syrian children who arrived in Germany without parents. And to maintain self esteem. “I do not want them to thank me. I want them to stand on their own,” she said. Once they are settled, she expects them to help a new group of migrants, just as she helped them and as someone once helped her grandmother. The pattern, she said, will continue. Alexander Blum is a contributing writer. 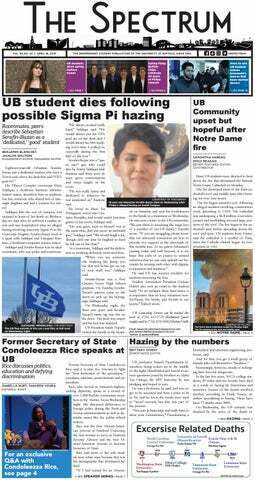 Questions and comments about this story can be directed to news@ubspectrum.com.